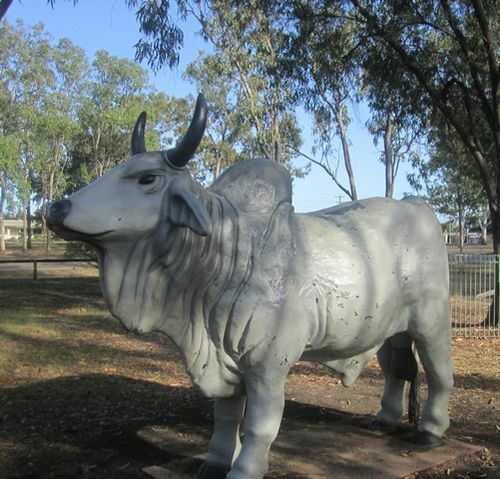 A statue of a Brahman Bull commemorates 50 years of the Australian Brahman Breeders`Association which started in Mareeba in 1946 as the Australian Zebu Breeders`Association. The introduction of Registered Brahman cattle to Australia in 1933 began the greatest revolution in the history of beef production in Australia. Droughts were turned into dry spells, the ravages of cattle tick disappeared and struggling beef enterprises became profitable. The development of the northern beef industry we know today was pioneered with Brahman cattle and they remain its foundation. A most significant event in history of the Australia cattle industry was the formation of the Australian Zebu Breeders`Association at Mareeba on 7 October, 1946 by two local cattlemen, Ken Atkinson from Wairuna and Maurice de Tournouer from Wetherby. From humble beginnings the Association, which changed its name to the Australian Brahman Breeders`Association in 1954, has provided leadership and guidance to develop the Australian Brahman breed to a position of eminence in the Australian cattle industry as well as the beef industry internationally. The Australian Brahman Breeders`Association has the distinction of being the largest beef cattle breed association in Australia. "W H." San Remo Farming Co.